Pesto and tapenade are now well known as all-purpose condiments that can be made in a few minutes and that will transform simply cooked meat, fish or poultry -- in fact, nearly any bland dish, from pasta to mashed potatoes. But try a simple and versatile sun-dried tomato pesto. Fred Plotkin, who divides his time between New York and Italy, includes a sketchy but informative recipe for sun-dried tomato sauce in his Recipes From Paradise (Little, Brown; 1997), a cookbook on Liguria (also known as the Italian Riviera). Plotkin is intentionally vague about the sauce's ingredients and their proportions, because he believes that anything beyond the distinct flavor of the dried tomato and the olive oil in which it soaks is nearly superfluous. With his guidance, and some experimentation, I've given the recipe more structure. You can buy sun-dried tomatoes already reconstituted and soaked in olive oil, but you may find, as I do, that the price is prohibitive. It's certainly easy enough to begin with plain dried tomatoes and reconstitute them. Since they will just about double in bulk, start with about one ounce (half a cup) of dried tomatoes to produce enough for this recipe. Soak them in very hot water to cover until they are very soft, about an hour. Drain them well, and let them sit for at least an hour in good light fruity olive oil to cover -- "preferably Ligurian," Plotkin noted. You'll need half a cup, more or less. 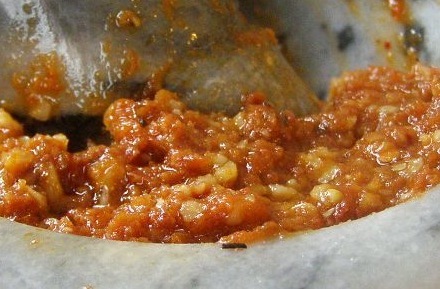 Traditionally, the tomatoes are pounded, usually with garlic, with a mortar and pestle. I use a small food processor (a blender is not as good). Plotkin adds a little lemon juice, as well as pine nuts, and I like basil. Against his advice, I tried adding anchovies or Parmesan, but he was right: other flavors merely confuse matters. The sauce is thick, like pesto, and more easily spread than poured. Plotkin likes it on tubular pasta, but warns that it should be used sparingly. It will keep, covered with a thin layer of oil and refrigerated in a tightly covered container, for at least a week. But its flavor is best when it is just made. Additional extra virgin olive oil if necessary. 1. Place the tomatoes and a tablespoon or so of their oil in a small food processor along with the garlic and a good pinch of salt. Process until fairly smooth, stopping the machine and stirring down the mixture with a rubber spatula as necessary. 2. Add the basil and lemon juice if you like; pulse the machine a few times to blend. Remove the paste from the machine, and stir in the nuts and just enough additional oil to make the mixture silky rather than oily. Taste and adjust seasoning. Yield: about 1 cup, enough for a pound of pasta or as a condiment for at least 4 servings of any cooked food.